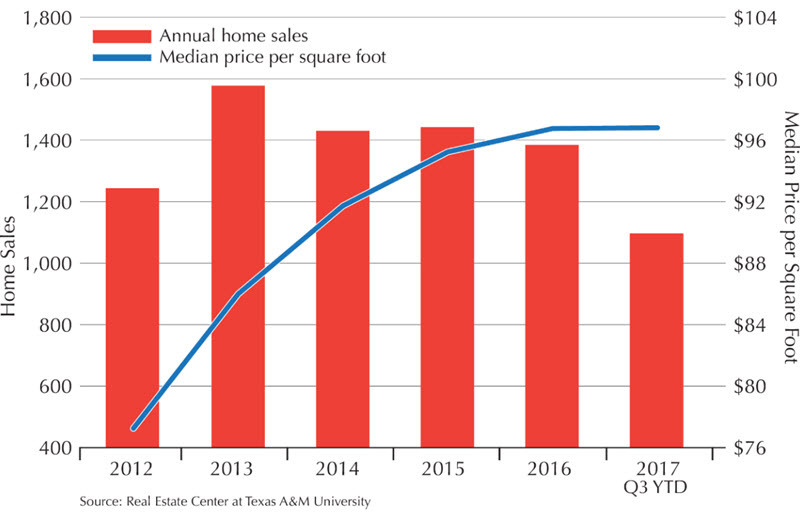 ​​​COLLEGE STATION – San Angelo’s housing market has been stabilizing since reaching record sales volumes in 2013. September year-to-date sales for Tom Green County were 1,098, which for the most part is on par with the same period last year. Active listings are down slightly from a year ago. On average, the active listings per month in 2017 has been 498, compared with 511 throughout 2016. “Housing prices continue to grow each year, and buyer sentiment is good,” said local appraiser and Realtor Laura Lacy with Angelo Appraisals and Lacy & Co. Realty. Third-quarter average home price in the county was approximately $185,000. Oil played a big role in San Angelo’s housing market bump a few years ago. Since 2014, sales volume for single-family homes has gradually fallen back to regular territory. Overall employment has also been in gradual decline, but that may soon change with oil starting to show positive signs. Oil prices, ​while still down from the latest boom, have been relatively stable near the $50-per-barrel mark, and production in the Permian Basin and Eagle Ford has steadily risen throughout the year. Hotel occupancy has also grown over last year according to the San Angelo Chamber of Commerce. For cities such as San Angelo, hotel activity can signify temporary housing demand since it’s often required for oil field workers. At this time it’s too early to tell what this will mean for local housing. Home sales in San Angelo have been most active along Route 67, particularly to the west of Loop 306 and Route 67. Within San Angelo, 353 homes were sold in the third quarter, an 8.9 percent increase over third quarter 2016. Year to date, 919 homes have been sold, for the most part on par with 2016. Active listings and months inventory are also about the same as last year. For more on San Angelo housing, read the Real Estate Center's third-quarter 2017 housing report​.